A typical cost per action (CPA) yield curve looks something like the figure below. On the x-axis we’re looking at the cost per lead or cost per sale generated by a digital marketing initiative (i.e. paid search, display advertising, affiliate marketing, etc) matched with the predicted maximum number of actions we’re able to produce on the y-axis. Viable advertising channels are most abundant near the right side of the graph. You can see why companies with higher gross margins have more flexibility when competing for customers. Depending on the market structure in which you operate, this marketing advantage may or may not be available to you. All else being equal, there are only so many keywords to bid on and websites to place ads on that will return a conversion at any specific cost per action. For example, in the graph below, theoretically if conversion rate is optimized there are only 1500 leads or sales available at an $18 CPA. 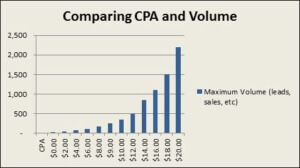 Scaling to 4000 leads at an $18 CPA is an unrealistic expectation. Don’t stop testing and optimizing your campaigns, but understand that the next increase in volume will come at a higher CPA with an increase of resources invested. If you calculate the marginal cost of an additional action you’ll notice that, like any other investment, advertising channels deliver diminishing returns. Therefore, there is a point on the yield curve where the next dollar will be best spent somewhere else. By understanding yield curves we can find the optimal spend for each channel. 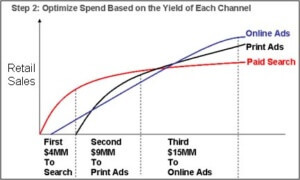 Notice in the example below, based on the steepness of the yield curve we would invest the first $4 million on paid search, the second $9 million on print ads, and the final $15 million on online ads. We’ve avoided spending a dollar over $4 million when our marginal cost per action starts rising sharply. Defining the relationship between sales volume and cost per sale through a yield curve can be built from historical data. This is obviously predicated on having the tracking capabilities to connect each action to its marketing tactic source. Once armed with this data, marketing can intelligently budget across all marketing channels.